Small ranging day 26pts might be a correction day after series of highly volatile trading day. Funda not so good wt Dalian ranging +50-100, Soy +0.10 – 0.20 & crude -0.5-1.7. Still mkt on mild bullish wt strong selling pressure. Good short at opening 3021-3005 & small scalping short 3010-3000. Not much activities. If price failed to break high at 3925 next week beware of profit taking activity. Anticipate good short entry at this point. 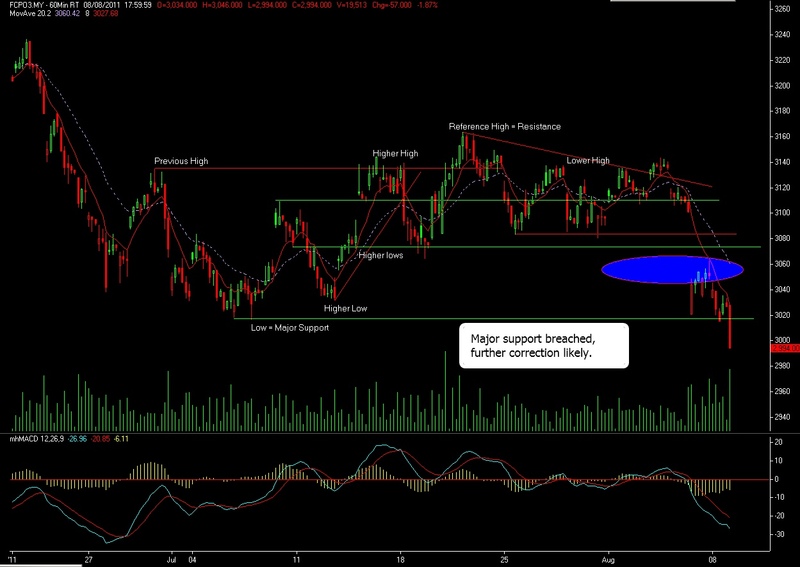 Expected mkt will range between 3020-2920 shud mkt fail to break high. If break high next Res at 3031-3063. US & Europe fin crisis still very uncertain. Anytime mkt can reverse from bullish to bearish. Overall still bearish wt strong Res at 3015 & Sup at 2915. Positive start wt Dalian & Crude in +zone. Soy in -ve zone but managable. Small impact gap up 2 pts. Good long 39-60. Later smal range 5-10pts towards 40-50 area in session 1. Session 2 start wt a blast. Gap up 63 shoot straight up to 82. 19pts 5mins candle. Big Player ?? Perhaps ! Good long at 63-75-80. 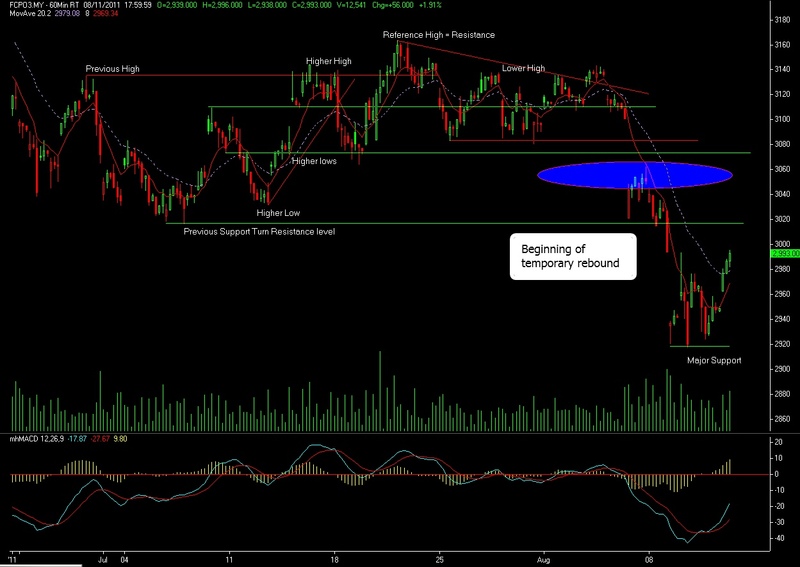 MUST chk against funda status b4 long entry. Mkt can go opposite way anytime like yesterday although strong funda. So quick TP & game plan discipline is always crucial. Things to highlight this week is a Pullback Correction entry which provide ample opp for profit in a highly volatile mkt. Stick to game plan quick TP 5 pts for CounterTrend & quick TP 10-15pts for Withtrend Pullback Corr entry. Open gap up strong bullish till 2975. Retests 75 & failed then retraced to 60-65. 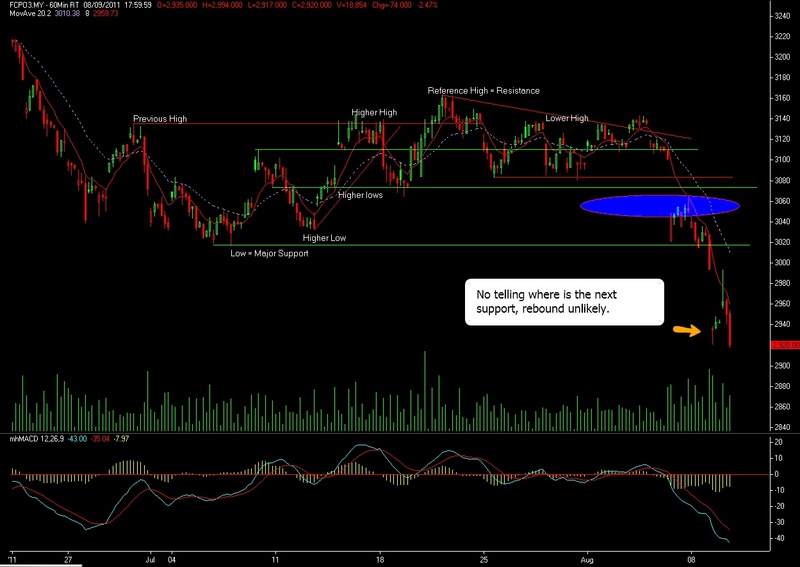 Session 2 totally beyond funda norm when mkt go opp side all the way to low 2930-24. Again, tricked by the funda. Possibly bearish sentiment still strong or panic selling in fcpo. Anyway, good entry long opening 2950-2975. Pullback corr long at 60-75 on session 1. Good short 60-30 on session 2. Pullback corr short at 53-30. Ample opp in volatile mkt. Volatile in this trending mkt. Overall bearish sentiment too strong. The best entry for this downtrending mkt at short 2990-2994, 2970-2960 down to TP at 2920. Last min selldown due to margin increased eff 100811 fr 5250 to 6250. 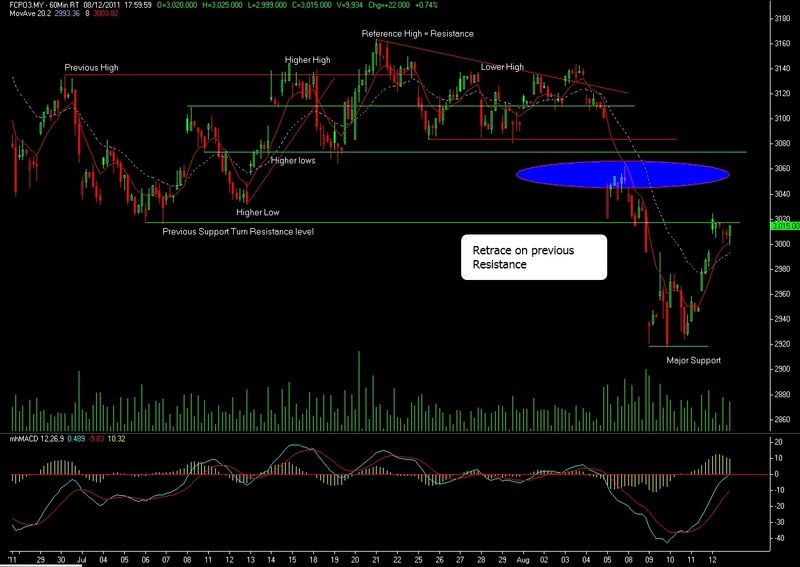 KIV for another gap tmr depending on Soy n Crude performance tmr. Trust your edge & always KIV for pullback correction entry which offer better profit ratios compare to counter trend entry. Panic Selling continues plus traders cover long pos when shorts are building up in terms of volume. Further gap down. Lower high at 3046 failed to break prev high at 3063. 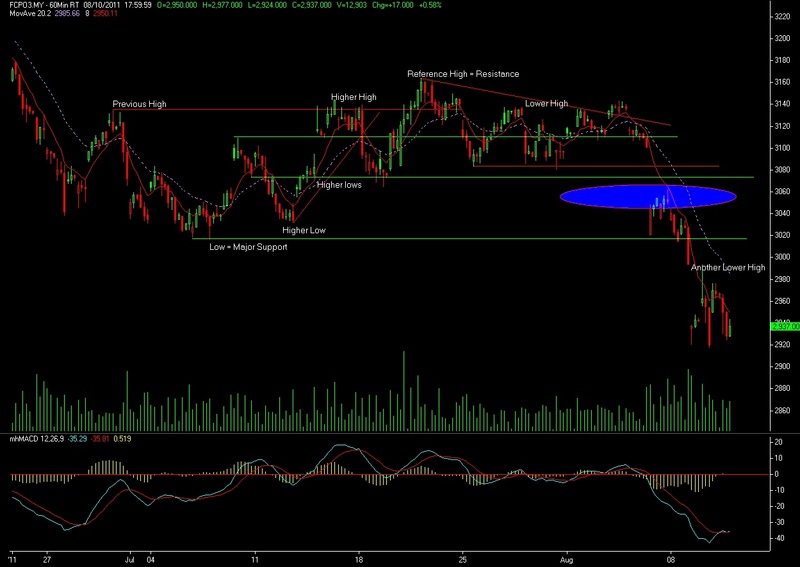 Lower low at 2994 breaking the phsyco level at 3000 signify BEARISH sentiment. Stay positive & restrategise accordingly. Sell at Res level 3030 & above , Buy at Sup level 2990-2975.